A Middle Eastern/Italian array of foods is offered at this The St. Gregory Hotel restaurant near Dupont Circle. 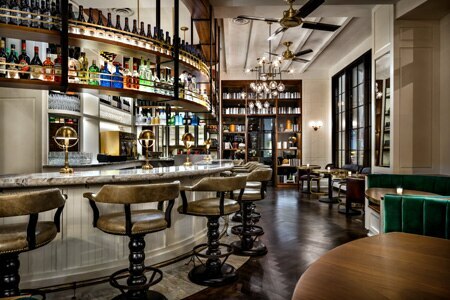 : Under a management change, The St. Gregory Hotel upgraded its focus to include Tredici Enoteca, sited in comfortable quarters on a landing overlooking the lobby. While the crowds can’t pack in, selective patrons can settle down to imaginative cooking composed by a talented executive chef, who pairs some Middle Eastern flavors with Italian dishes. All this results in an array of food that starts with bacon-wrapped dates stuffed with manchego and blue cheeses and Moroccan ribs with a spicy rub, plus oysters, shrimp cocktail and crunchy falafel patties and continues with main plates of lollipop lamb chops with aïoli, branzino with cauliflower purée and buttery-roasted Amish chicken. Sides are equally tempting and even include flatbreads with Berkshire pork sausage or pistachio pesto with mozzarella. As for a sweet conclusion, dessert options may change, but you will enjoy the lemon meringue tart or the rich tiramisu. Sparkling cocktails and a clever wine list pair well with the creative menu.